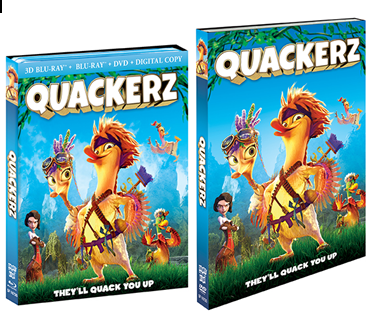 June 14th, 2016, Shout Factory releases QUACKERZ the newest of the their exciting line-up to two-disc Blu-ray™ 3D Combo Pack (Blu-ray 3D and 2D, DVD and digital), DVD, iTunes, Redbox and across all major VOD platforms. 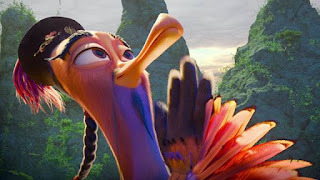 Being that we have quite a few chickens AND my daughter has been asking for ducks for a while, I figured this would be a cute one for the family to watch together! The synopsis says "When the peaceful island of the Mandarin Ducks is mistakenly invaded by the Military Mallards, a conflict flares up between the Mandarin Emperor and the Mallard Commander. Longway, the Emperor's son, and Erica, the daughter of the Mallard Commander, meet… and before long, a friendship takes wing. While their feathered fathers fight and egg each other on, the wicked Ms. Knout is con-duck-ting a scheme to destroy the sun. The kids will have to get all their ducks in a row to battle their foe… but waddle they do if her foul plan succeeds?" The boys had a chance to watch before we all could and they both loved it. They thought it was great how the chickens still helped the Mallards in the end even after they had their own "issues" with them. I loved how the boys came to me to share about how everyone needs to put the past in the past and help each other when the time comes.